SPORT: The day belonged to Dan Knox he caught two tagged fish from Grindy’s as part of his 7 fish catch. Andy claimed a total bounty of £400 and is the first anglers ever to catch two tagged fish. See pic. 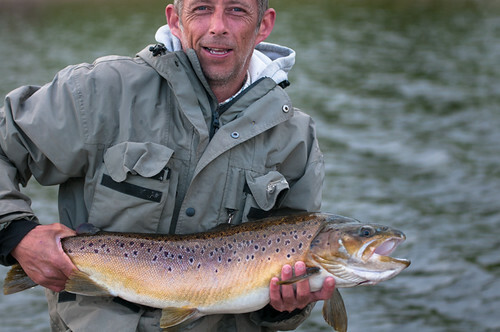 There are still 10 tagged fugitive trout at large in the reservoir each worth £200. Today was a lot brighter than yesterday so we didn’t see the same dry fly action as yesterday but they still caught fish for some anglers. Lures out fished them though probably by about 5 to 1. The top rod was Rick Nuttall with ten fish, his boat partner Andy Cooper also had a good day with 7. Any caught on daddies but Rick caught mainly on damsels and cat’s whiskers fished on an intermediate line. Dan Knox is the 1st ever angler to catch two tagged blue trout. He claimed a total bounty of £400! There are still 10 more at large. This entry was posted in Stocks Reservoir Fishing Reports on August 31, 2013 by Ben Dobson. NOTABLE CATCH: 14+ trout for Steve Smalley, 14 trout Ray Entwhistle & 12 trout for Dave Flitcroft. SPORT: It was a great days fishing at Stocks. I think this morning fished a bit better than this afternoon probably because the weather took a bit of a turn for the worse. On the shore: Dave Flitcroft fished his way back from Newclose bay with a floating line, a cat on the point and diawl bachs on the droppers to take 12 trout. Dave said that there were a lot of fish very close in and it paid to hang your flies at the end of each retrieve. Ray Entwhistle took 14 from Hollins Bay on black n green fritz and buzzers and Antoon Gysbers took 7 fish in just 3hrs whilst twiddling daddies along Ben’s Beach. On the Boats: Ben Bayliss and Adam Larbelastier had 17 trout to their boat on cormorants and minkies fished on slow intermediate lines. Their best areas were Grindy’s Lawn and the Northern Shallows. This entry was posted in Stocks Reservoir Fishing Reports on August 30, 2013 by Ben Dobson. SPORT: Thursday 29th August. A change in the weather today feeling much cooler this morning than it has been of late although the temperature did rise this afternoon as the sun made an appearance. There has not been as much fly life on the water today but most of the best catches have still fallen to a well presented dry fly. On the bank the best catch went to Ray Mercer who caught 4 fish. Ray found Hollins bay and the jetty area to be his best spot. Malcolm Hunter was out on a boat and landed 7 fish. Malcolm fished all over the northern end of the lake and caught his fish on a combination of dabblers and a woofter booby. Peter Andrews and Stuart McCaughey caught 9 fish between them from all over the water. They caught a couple of their fish on diawl bach but the majority of their fish fell to various dry flies. Phil Burgess and Pete Navin caught 11 fish between them. They drifted all over the northern end and caught on dries, lures and crunchers. Tony Taylor found similar areas holding trout with all 7 of his fish falling to daddies and hoppers fished right on the top. Paul Davison and Derek Moore had a good days fishing landing 30 trout between them! They drifted all over the northern end and caught all their fish on dry flies. Included in Pauls catch was a tagged blue trout which earned him a £2oo bounty. The tagged fish fell to a midas dry fly and was caught at the causeway. I find it quite fitting that Paul got his tagged trout, with the number of fish he has caught over the last few weeks here at stocks it was only a matter of time. Well done Paul. See you on the water Paul. Paul Davison caught this tagged fugitive trout on a Midas fished dry at the causeway. He won the bounty of £200. There are 12 more tagged trout still at large in the reservoir. This entry was posted in Stocks Reservoir Fishing Reports on August 29, 2013 by Ben Dobson. Perfect conditions today here at Stocks with overcast and moderate wind creating a ripple on tbhe water by morning then picking up through the afternoon. Plenty of fish seen moving up near Gull Island today. Boat has fished slightly better than bank today which has been a running theme of the week. Here’s the best of the bunch.. Various anglers had 2 fish a piece today..
Ken Whiteside had 4 fish today from Bell Point and was using a damsel. Ken hooked 7 but landed 4..Some good sport there Ken! G Brewer caught 6 fish in total today. His best was a 2lb 4oz rainbow caught off Bell Point. He was successful using a daddy and a yellow tail lure. Good effort. Brian Hitchen also had 6 fish from the bank today. Brians 4 fish bag weighed a healthy 8lb and they were all snatched using nymphs. Well done Brian. Peter Hill was out today with his wife who was enjoying giving fly fishing a go for the first time. Peter managed 4 fish to the boat all of which rainbows and caught using daddies. Well done glad you had a good half days sport with us. Russ Farrand also managed 4 fish to the boat. Russ caught in Hollins Bay using a gold headed cats whisker. Paul Tweddle was top rod today by a good stretch and said that he was hard at work out there covering rising fish that were plentiful but almost too high in the water when topping. Needless to say Paul managed 10 fish in total which is a great result and clearly hard fought for. Paul was fishing dries and caught around Gull Island between 10am-2pm. Nice angling there! This entry was posted in Stocks Reservoir Fishing Reports on August 28, 2013 by Ben Dobson. SPORT: A very warm bright day today up at Stocks and with a moderate easterly breeze. Lots of fish seen moving about up at the top end of the reservoir towards the Causeway but they were playing hard to get.. Bank has been very tricky today with only a few anglers managing a fish each but the boats have done well. Here’s the best results of the day…. Jim Hockenhull had 4 fish to the boat today using various flies. His best was a 2lb 8oz rainbow. Ian Greenwood and Mark Tyndall had 8 fish to the boat between them with 5 of them falling to Ian. They caught using traditional red/black wet flies. Anrew Roskill had 5 fish to the boat on a very short trip out mid afternoon onwards. He caught using a greenwell’s fly and his best was a 3lb rainbow. Nice fishing. Bernard McBride was top rod today with a well earned 7 fish to the boat. He caught all 7 on daddies and was fishing the Northern Shallows. His best fish was a 10lb + rainbow. Well done Bernard nice angling. This entry was posted in Stocks Reservoir Fishing Reports on August 26, 2013 by Ben Dobson.